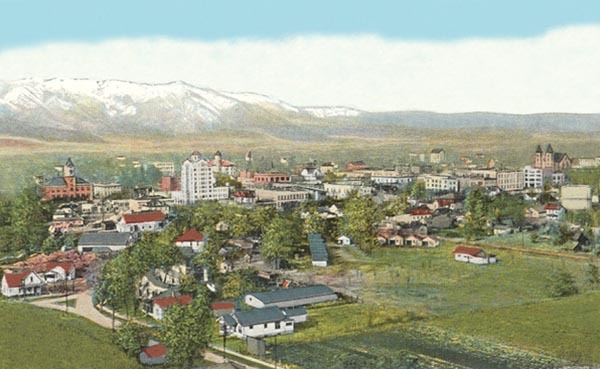 Baker City is relatively small, with around 10,000 residents. The community lay along the famous Oregon Trail and really took hold after the railroad came through. By 1900 it was the largest city between Salt Lake City and Portland. It rests between the picturesque Wallowa and Elkhorn Mountain and the setting is quite pretty. The city is named after Senator Edward D Baker, the only Senator to die during military conflict (during the Civil War in 1861). Baker City Tower, a nine-story concrete structure, Oregon’s tallest building east of the Cascades. The Art Deco tower features terracotta eagles at the ground-floor entrances and an octagonal observation center at the top. The Geiser Grand Hotel opened in 1889. At that time, it had modern marvels like electric lights, an elevator, and plate glass windows. Originally called the Washauer Hotel, it was renamed a few years later when it was purchased by the John Geiser, a local mining investor. I’m told this is a very fine hotel and I’d like to stay here sometime.